True to its name, El Tesoro Ecuatoriano (Ecuadorian Treasure) is a great find, and also not lacking in shiny, bright objects. These objects are mostly plugged in though, and of the neon variety. The lights reflect off the shiny copper tables and through the soups and any other reflecting surface. This restaurant specializes in the cuisine of the coastal regions of Ecuador, and is not shy about making that clear even outside with a giant shark surrounded in neon. Inside, the menu boasts a full page of seafood and ceviche, probably the main draw of the place. We tried the ceviche de concha ($9.99, not shown) which in English translated on their menu to "black shells cocktail." It truly was a cocktail of sorts, with a black gooey center to be pulled out of the regular citrus marinade. 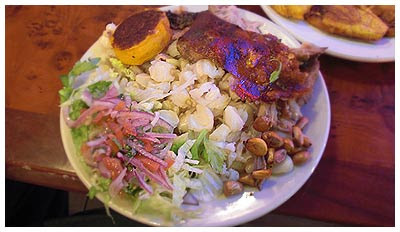 Another dish I can never refuse when eating Ecuadorian food is the hornado. The dish is very typical of non-coastal mountainous regions of the country, but is still done very well here ($9.99, above). The pork is as tender as can be and served under a crusty, marinated skin. The whole plate is fashioned very nicely, piles of each item falling on other piles. This is all possible at a table, but in Ecuador this is usually served on the street quickly in an even more beautiful mess. The mote (hominy) is definitely the central figure here, and ample amounts of the dried and then alkalized corn is heaped right in the middle. The dish is also served with a tostado, a small fried corn bread. I also wanted to try a soup only available on weekends called caldo de bola ($6.99, below). The ball in the center is beef inside of a plantain mash, but my ball had already burst upon arrival, much to my dismay. No matter though, the bits and parts made the soup especially hardy and I enjoyed every bite. The plate of patacones (fried plantains, $4) was also a good deal and enjoyed by everyone. 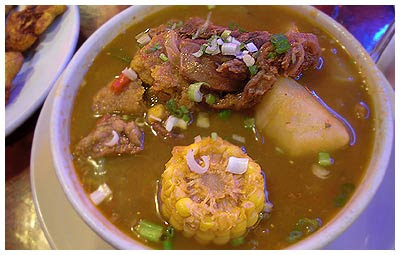 The neon glow outlines all the ingredients in the caldo de bola. We had somewhere to be afterwards, but I think we were all wishing we could stay to enjoy more of the $3.50 beers, blaring jukebox, neon discs above, and fútbol on TV.